Mutiny on the Bounty by Charles Bernard Nordhoff. Our pastor mentioned this story in church a while back and it sounded really interesting. It was a really good story, and I learned a lot about life on a ship. The Witch of Blackbird Pond by Elizabeth George Speare. This was a pretty good story. The Writer's Guide to Everyday Life in Regency and Victorian England from 1811-1901 by Kristine Hughes. This was okay. However, I liked What Jane Austen Ate and Charles Dickens Knew better because that book used literature. I did learn a lot about Queen Victoria and her influence though. The Scarlet Pimpernel by Emmuska Orczy. Lud love me, I Loved, loved, looooved this book! Just Listen by Sarah Dessen. This was okay, as are all Sarah Dessen's book, but I would rank this near the bottom of her books. The Horse and His Boy by C.S Lewis. What can you say, it's C.S Lewis! There is a reason people love Narnia. It's been a pretty busy reading month. Great Expectations by Charles Dickens. Good, although I liked the original ending better. He let his friends talk him into writing a "happy ending", but I think his original one fit the story much better. Mini Shopaholic by Sophie Kinesella. I didn't even realize there was another Shopaholic book out until I happened to find it on the "hot" shelf at the library! All fluff of course, but you need to read fluff every once in a while. Confessions of a Jane Austen Addict by Laurie Viera Rigler. This was okay. I was expecting it to be better though. Loved the idea, but some parts of the plot were just a little too murky. A lot of vague, feel-good, wishy-washy stuff was said to explain key parts of the story. I think they were meant to be deep, and sage and clever. Didn't work. Rude Awakenings of a Jane Austen Addict by Laurie Viera Rigler. Okay, I actually liked this one better than the first. Only it was too predictable because it was the same story in reverse. Kind of wish I would of read it first. And the ending really didn't make sense. I have to say ,though, this book actually made me ponder a lot of things. What would it be like to suddenly wake in the future? How fast could one adjust? And would it be easier to wake up in the past, since theoretically you would at least have knowledge of the time? Cure by Robin Cook. Not too bad. I saw glimpses of the old Robin Cook in this book. His last couple books gave me the feeling they were hastily written to meet his yearly quota. This one was better, maybe it was the return of the mobsters. The Girl With the Dragon Tattoo by Stieg Larsson. This is supposed to be some great must-read book. I don't get it. I thought the characters were disturbing and the mystery mediocre. Ender's Game by Orson Scott Card. I really liked this one. I liked the characters, the conflict and the whole future world that Card created. Jane Fairfax: The Secret Story of the Second Heroine in Jane Austen's Emma by Joan Aiken. What's a month of reading without at least one Jane Austen spin-off? This was a good one. It wasn't nearly what I imagined Jane Fairfax's side of the story to be, but then again that would of been boring if it was. A Tale of Two Cities by Charles Dickens. What an amazing story! Son of Hamas by Mosab Hassan Yousef. This was another amazing story, only this one is true! Not only was Mosab Yousef disowned by his family for choices he made, but publishing this book has, i'm sure, placed a target on his back. Three by Ted DeKker. Very, very good! A nice twist at the end, which I love in a story. Phantom of Pemberly by Regina Jeffers. I really enjoyed Regina Jeffers's Wayward Love, about Captain Wentworth )from Persuasion). However, this one seemed too long and dry. I kept finding myself wishing it would end already. I was also expecting it to be a little bit spookier. Mercy's Embrace: So Rough a Course by Laura Hile. This is the first in a trilogy about Elizabeth Elliot. Really enjoyed it. I loved how she drew characters out of other Jane Austen novels. I also love how she takes Elizabeth Elliot as we knew her in Persuasion, and changes her through circumstances instead of pretending she was misrepresented in Persuasion. Bleak House by Charles Dickens. Well, it took months to read, but it was worth it. A little bit or romance, a little mystery, so many well developed characters. Dickens can really spin a tale. The Great Gatsby by F. Scoot Fitzgerald. I understand this is a considered one of the "Great American Novels" because it gives us a snipped of the American Jazz Age. It was a bit interesting to get a glimpse into the roaring 20's, but otherwise I didn't really see the big deal. Speak by Laurie Halse Anderson. I saw this movie, and thought the book might be good. It was okay, but didn't really offer anything more than the movie. Mockingjay by Suzanne Collins. The long awaited ending to the Hunger Games trilogy! It was good, but I would have to say it ended with more of a fizzle than a bang. I don't want to say much more for fear of giving away spoilers. The Telling by Beverly Lewis. Another final book in a trilogy. Although the whole thing about treating non-Hodgkins lymphoma naturally was a little hard to swallow. But that's just me. Jane Bites Back by Michael Thomas Ford. Jane Austen didn't die, in fact she is a vampire who owns a bookstore. At least that's the premise here...and it could of been a good story too except for her character. Even 200 years ago Jane Austen was pushing at the societal standards, so to see her character written so weak and wishy-washy was disappointing. She needed more "bite" herself. The Help by Kathryn Stockett. This wasn't at all what I expected, I actually thought it was supposed to be humorous! It was, however, very good. A poignant mix of stories that blended together to give you an idea of life for blacks in Mississippi during the 60s. 1984 by George Orwell. For as long as I can remember I have been hearing about "Big Brother" and the "Thought Police". I picked this book up in the library, and it occurred to me that although I knew the story well, I had never read the actual book! It was actually so much more complex and deep than I expected. Very good. Austenland by Shannon Hale. I was looking for an Austen fix and came across this book. The idea is so cute, Jane Austen addict takes a vacation to a retreat in England where you dress the period and follow regency rules. The romance was so disappointing. I got the feeling that the author knew how she wanted to end it, and was just trying to "connect the dots" to get there. What Jane Austen Ate and Charles Dickens Knew: From Fox Hunting to Whist-The Facts of Daily Life in Nineteenth-Century England by Daniel Pool. Loved this book! The only problem was it covered 100 years, and of course things change so much over a century. Just imagine how different 1900 and 2000 were. The author was good about clarifying what part of the century, though. Fang by James Patterson. I know, I know! Every time I read one of these Maximum Ride books, I swear them off forever but then a new one comes out and I can't help myself. I have to say, this one wasn't half bad! Much better than the last several ones. My American Adventure by Amy Burritt. Two parents sell their business and spend a year visiting every state in the U.S. This book was the perspective of their 12 year old daughter. Very good book, and what an incredible opportunity! Fahrenheit 451 by Ray Bradbury. Another classic to cross of my list. This story is 60 years old, but still so relevant! I liked it. Tomorrow, When the War Began by John Marsden. Some kids go camping in the Australian Bush and return to find their country has been invaded and overtaken. This is the first in a series. Not too bad. Sort of Red Dawn, Australian style. Life As We Knew It by Susan Beth Pfeffer. Asteroid hits the moon and forces it closer to earth, reeking all kinds of havoc. An apocalyptic story. The author seemed to want to end it on a good note though, which confused me. Also, this was definitely not a "love your neighbor" story. It was more like a "look out for your own" story. It made me wonder why you would fight to survive only to live like that. Fallen by Lauren Kate. Not too bad, although a little confusing at the end. 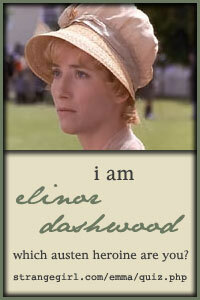 I think I even mentioned somewhere on this blog, that of all Jane Austen's heroines, I related to Elinor Dashwood the most. Servant of one awesome God, wife to one incredible husband, mom to four super boys and one sweet girl...just hoping for a minute to sew!